Picture floating peacefully above the city of Albuquerque during the calm wee hours of the morning with the Sandia Mountains and one of those famous New Mexico sunrises as a backdrop and you can begin to imagine why droves of visitors annually descend upon sleepy Albuquerque to attend the city’s annual International Hot Air Balloon Fiesta. Begun over three decades ago with 13 balloons and 10,000 guests, this week-long festival has grown into a Disney-esque spectacle featuring some 600 Balloons and attracting more than 750,000 guests, nearly doubling the size of the city over the course of the event. This week, I was invited to check out what has become not only the world’s largest ballooning festival but also one of the most photographed (aka most Instagrammable) events in the world and it didn’t take long for me to clue in on the fact that this annual fiesta of fun is at once a part of the fabric of the city of Albuquerque and also a point of pride for residents. In fact, when I arrived at the airport to take my turn on one of the hot air balloons, my Uber driver, abuzz with excitement about all the international teams she had picked up and the week’s festivities, proudly became my de facto tour guide – recommending restaurants, giving me the low-down on the Breaking Bad tour of the city (the show was filmed in Albuquerque for those unfamiliar with that fact), and giving my choice of hotel (Hotel Chaco) the thumbs up. She also gave me important advice about how to dress for my first hot air balloon experience for which I would become eternally grateful. The next day I was up at 4 AM, enrobed in six layers of clothing (basically everything I had packed along with a newly acquired Breaking Bad baseball cap) and en route to the Fiesta unsure of what to expect. What I arrived to was what I can only describe as the equivalent of a Southwestern county fair bordered by an Alice in Wonderland-like collection of hot air balloons being prepared for takeoff. The morning was chilly, but the mood was light as I milled about the stalls of local purveyors hawking everything from clothing and coffee to arepas, green chile burritos and other local favorites. It was “International Day” and, along with my fellow amateur balloonists, I was filled with childlike exhilaration about the new experience that lay ahead. Things kicked off with the Dawn Patrol, a sort of hot air balloon light show, choreographed and set to music, that occurs as the first balloons inflate and take off in the dark, offering other pilots an early idea of wind speeds and directions at different altitudes. Then, just after sunrise, it was time to join the team, inflate our balloon and hop into the basket for takeoff. I had expected to feel some anxiety or, at the very least a jolt, as we took to the friendly skies, but, in fact, I had none. 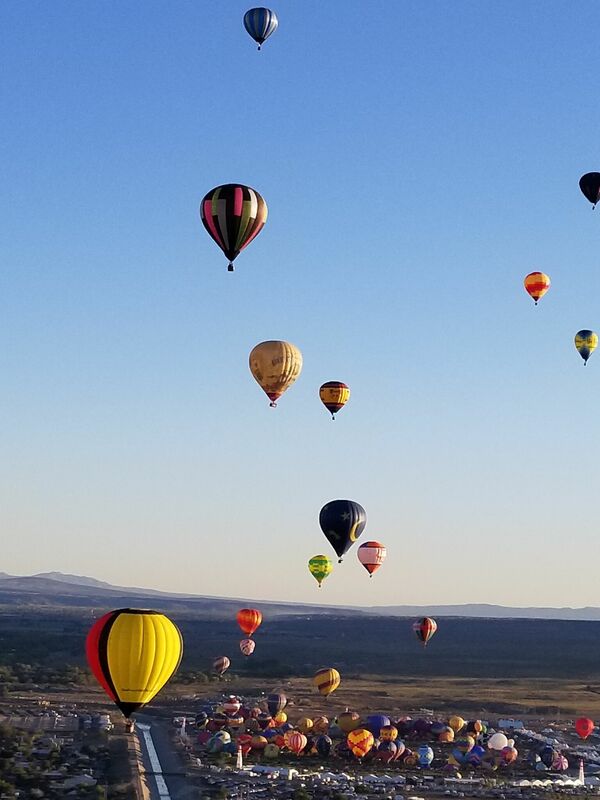 The launch was remarkably smooth and within minutes we were airborne, joined by an explosively colorful array of hundreds of other balloons drifting across the Albuquerque horizon. It was, in a word, spectacular. The sky was crystal clear as we sailed across a downtown that had yet come to life, glided over the hustle and bustle of neighborhoods waking up to the dawn of a new day, and even hovered above the famed Rio Grande River, before landing in a school yard, where we were welcomed by waving junior high school students whose giddiness at the sight of our balloon descending onto their school’s grounds reflected the infectious quality this annual festival brings to the entire city. Talk about one for the bucket list. The flight was a truly magical and utterly tranquil experience and it is also one that you too can still experience if you happen to be in Albuquerque this week. 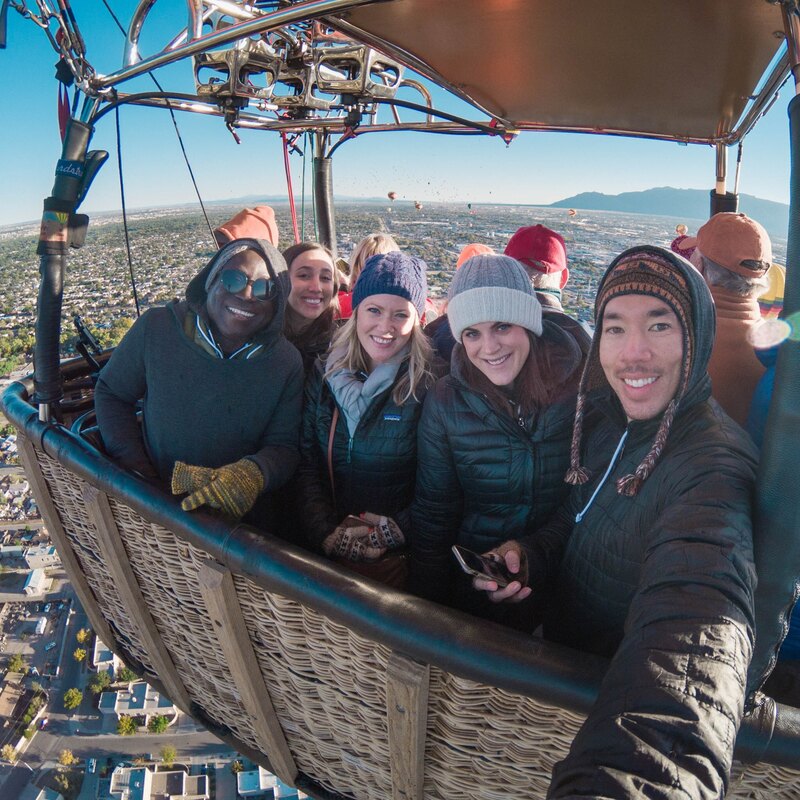 Over the years, many companies have supported the festival including everyone from Hendricks Gin, which registered its own balloon this year, to Canon, which has a tent where visitors can get a complimentary photo taken and borrow a camera to test out in flight. Not to be outdone, rideshare giant Uber is also getting into the hot air balloon game this year. On the heels of UberBOAT in Croatia, UberCOPTER in Cannes, and UberVALLE in Guadeloupe, Uber is launching Uber Hot Air Balloon this Saturday, October 14th, the most popular day of the fiesta. 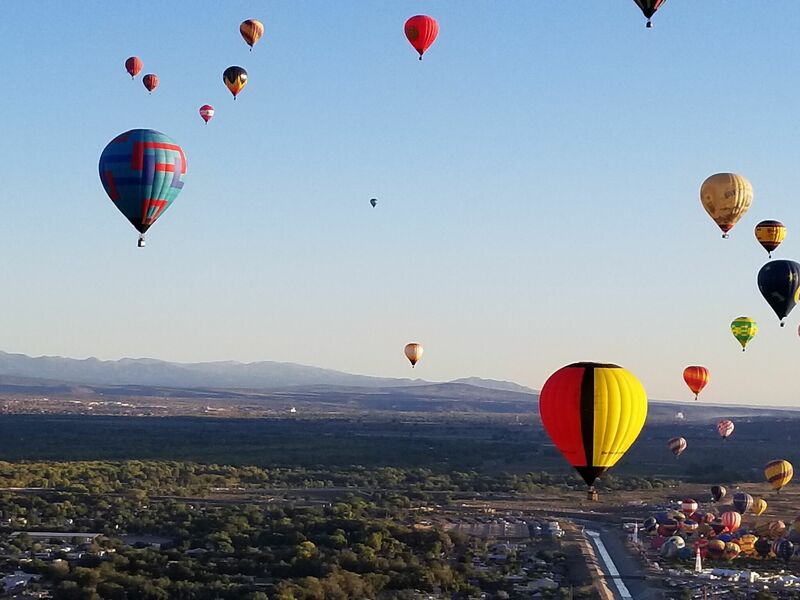 For this one day only, Uber users in the Albuquerque area can request a free hot air balloon ride with Rainbow Ryders in the Uber app just as simply as ordering a normal ride with no advance notice or reservation required. A special “Hot Air Balloon” option will appear in the app beginning at 4 AM on Saturday which users are invited to tap. If successfully connected, an Uber representative will call to confirm the request and a complimentary UberX will be sent to pick users up for their free hot air balloon ride. So all that magic that I just referenced above will available to visitors and residents of Albuquerque come Saturday morning via Uber Hot Air Balloon. In fact, Uber may be the only way to book a ride at this point as most of the spaces on the various balloons have all been reserved well in advance. Of course, you can always just buy a ticket to the festival and watch the lovely balloons from the ground, which is pretty extraordinary in and of itself. But why watch when you can fly? For more information about the 2017 International Hot Air Balloon Festival and all the attendant activities, click here. To read this story on the Huffington Post, click here.